Brancaster Staithe01485 201256work VillageNow a popular sailing centre surrounded by atmospheric coastline, Brancaster Staithe was once a Roman town and thriving port, exporting corn from the local hinterland. Famous for its mussels, the fishing village of Brancaster Staithe lies on the shores of the beautiful Norfolk coast. You will find plenty of fishing boats and you can buy their catch from fresh fish stalls at the harbour or along the main road through the village. The harbour is also home to Brancaster Sailing Club, with many sailing dinghies stored in and around the harbour. If you are sailing, you can launch a boat (voluntary launching fee applies) and sail in the sheltered waters of Scolt Head Island; or if you venture a little further west along the Norfolk Coast Path you will find the Roman Fort of Branodunum, a Schedule Ancient Monument. Visitors can follow the history of the fishing industry at Brancaster Quay and enjoy one of the many courses such as sailing, orienteering and kayaking, available at the Brancaster Millenium Activity Centre. The village offers chandlery facility and two public houses, The White Horse and The Jolly Sailors. Now a popular sailing centre surrounded by atmospheric coastline, Brancaster Staithe was once a Roman town and thriving port, exporting corn from the local hinterland. 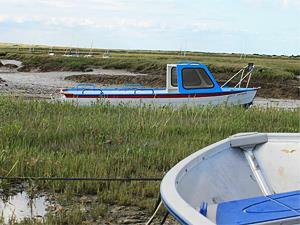 Brancaster Staithe is also a great base to start exploring the beautiful coast and coast path. Head west to find Brancaster beach with its vast expanses of golden sand, or east towards the neighbouring village of Burnham Overy Staithe. on A149 between Hunstanton and Wells-next-the-Sea.